Klipsch develops ProMedia in-ear headphones for gaming | What Hi-Fi? Available in a black finish with red detailing, they come with three pairs of different-sized oval ear tips, carrying case, clothing clip and VOIP/gaming adapter (compatible with a PC or Mac). Noise-cancelling "enhances the music and gaming experience", claims Klipsch, and the hands-free mic makes them suitable for VOIP (voice over internet protocol) calls and computer gaming. 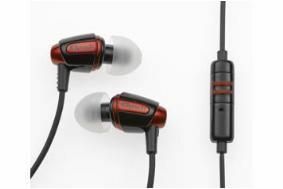 As for sound quality, there's a custom transducer in each ear piece, using an 8.5mm driver and moving coil technology with a dual-magnet motor structure. You can buy the Klipsch ProMedia at Amazon, Klipsch UK and selected retailers for around £90 (Amazon currently has the discounted at £77).